Cheerful Events: Hooray for Hollywood! April and Lana's trip to California has been accompanied by the rainiest December in Southern California in a hundred years by some accounts. And since they have been primarily staying at my parents house they have experienced the joys of a partially flooded house, freezing cold temperatures because the AC unit was wrecked in the rain, and mud everywhere. Now with their time here coming to an end the family has been making a push for them to see some of the sights that they want to see while they are here. Today Melody got Jason and the girls into Disneyland, I hope they are having a great time. On Sunday Dale took them and Jason all over the coastline in Orange County. They went to Dana Point, Laguna Beach, Newport Beach and Balboa Island, all in the pouring rain! Kind of an interesting take on the Southern California beaches. Yesterday at their request I took them to Hollywood. Fortunately the rained cleared up and the day was brisk but beautiful. 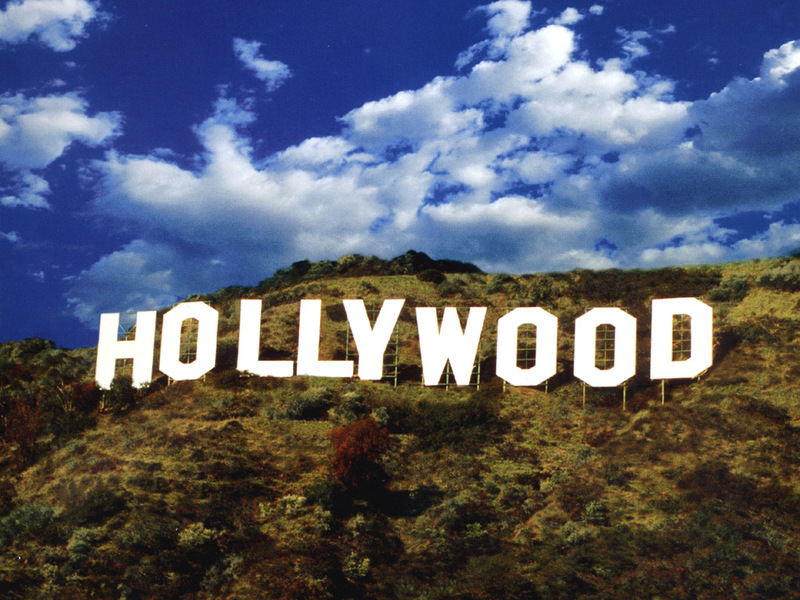 People visiting from out of the state often want to see Hollywood, but it is in many ways a disappointment. It is pretty run down and grungy even though it has been getting better over recent years. Becky takes classes and performs at IO, an improv comedy club that is right on Hollywood Blvd and that would have been fun to take them to but it is 21 and over so that wasn't a possibility. Of course seeing the Hollywood Walk of Fame is always cool especially because my Dad's group, The Sons of The Pioneers, have a star in a very prominate place on Hollywood blvd, right outside the Kodak Theater where they host the Academy awards. I remember attending the unveiling ceremony as a kid, although the Theater wasn't there and I think they moved the location of the star too. We saw the stars in the sidewalk, Gromins Chinese Theater and were simultaneously grossed out and amused by the street performers who dress up like celebrities and characters and interact with the crowd to pose for pictures for tips. The costuming of the look alike's range from OK to really cheesy to "wow that hasn't been washed in about 5 years". We hit the many souvenir shops along Hollywood Blvd so the girls could get their California souvenirs and luckily there was a Harley Davidson shop there since that was also on the to-do list for Lana. We had a milkshake at the Disney Soda Fountain that is outside of the El Capitain theater and people watched from inside the building. There are always plenty of interesting people to watch in Hollywood. Just how inappropriate the Sponge Bob Square Pants was became very clear as we watched him awhile. I guess the most notable was the guy who was maybe a year or two older then the girls picking his nose right outside the window, and I hate to even write this but apparently he was hungry too..cause you know what he did with it? Well you can guess..... it was disgusting! Personally the photo that best represents Hollywood as I see it, is this street sign we passed on our way out of town. A black bra hanging over a no pedestrian crossing sign. I don't know why but this just screams Hollywood to me, plus I guess you can't cross the street there if you are wearing a bra? We left the lovely city of Hollywood to meet up with Becky for dinner and because we were so enchanted with the place yesterday we went back to the Americana beautiful center to show it off to the girls, and they loved it too. 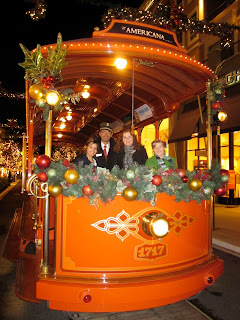 We even rode the Trolley this time! Ding! Ding! And Hooray for Hollywood!